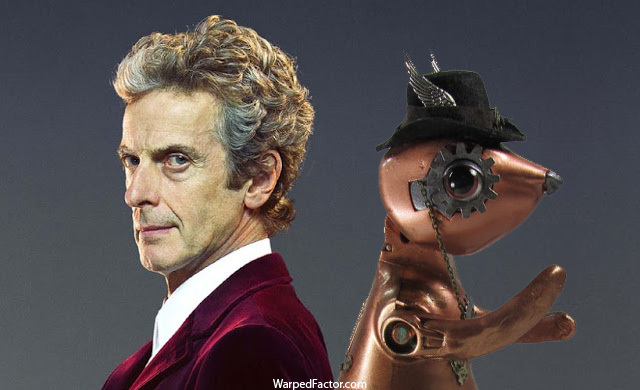 Doctor Who: The Next Companion - Nut-C, The Clockwork Squirrel | Warped Factor - Words in the Key of Geek. Jenna Coleman has barely announced she's leaving and fandom is buzzing with ideas for her successor by the Doctor's side. While like my pal Wil, I forever look forward to the Time of the Penguin, the translation of Robert Shearman's audio version of comic strip companion Frobisher into full on-screen companion status, I myself have suggested Lisa Bowerman as Paul Cornell's Bernice Surprise Summerfield, and my pal Gail has gone through what the next companion should - and shouldn't - be like. Step forward Toby Whithouse, with a throwaway gag. The Doctor: Why don't I have a radio in the Tardis? Clara: You took it apart and used the pieces to make a clockwork squirrel. Boom! There you go. I give you Nut-C (C for Clockwork, obviously), the clockwork squirrel, the Doctor's next companion! What's more, think of the changes taking place in the Twelfth Doctor's world. He's traded in his trademark shelf putter-upper for a pair of equally naff-cool sonic shades. What could make more sense than upgrading his question-asking human to a wind-up wisecracker with a kleptomaniac streak? 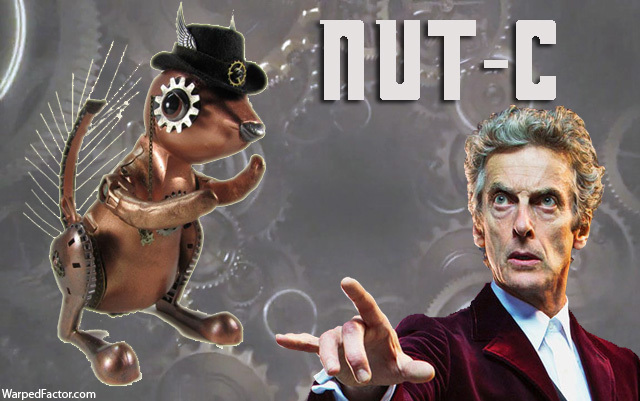 Nut-C, the clockwork squirrel, could be a solid comic foil to the Capaldi Doctor (or indeed any Doctor on the other side of Christmas), and could be realised via a combination of a solid prop and CGI, with a range of skills to back up the screwdriver-free (or at least screwdriver-lite) Time Lord. 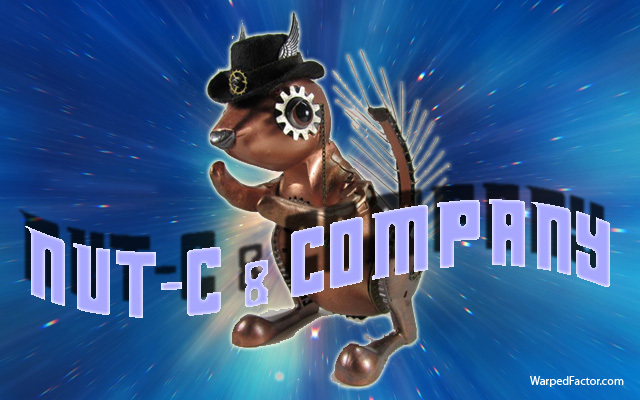 Imagine a clockwork squirrel that can interface wirelessly with the Tardis, allowing Nut-C to bring the time machine to its or the Doctor's aid at the twitch of its paws. A clockwork squirrel with a defensive blaster packed into its steampunk tail. A clockwork squirrel with cybernetic teeth for the chewing through of deadly cables and super-speedy engineering paws for techno-chicanery. A clockwork squirrel who can do all the daring, Mission Impossible stuff that ordinary squirrels can do on clothes lines and bird-feeders if there's a free meal in the offing. A clockwork squirrel that can produce from inside itself (Nut-C would naturally be bigger on the inside) cheekfulls of specially programmed nano-nuts - explosive nuts, corrosive nuts, tracking nuts, chrono-nuts to form localised time loops or time glitches. And perhaps best of all, a clockwork squirrel with a sarcastic personality glitch, but who can also download the personality of prior Tardis travellers from the databanks on a whim, allowing companion actors who might otherwise not have the opportunity to record on-screen stories with the 21st century Doctors to live again and have one more trip in a Big Finish audio voiceover style. Lucie bleedin' Miller, on-screen, as a clockwork squirrel? You can't tell me you wouldn't watch that! Then, years down the line and long after its time on the show, Nut-C will have a renaissance. Dedicated sarcastic squirrel fans will demand a spin-off. Nut-C and Company will be chronically badly judged, and eventually the character will be resurrected for a bafflingly long single season of kid-friendly adventures in Australia and co-opted into Big Finish stories alongside its original Doctors. But the character will make one or two more day-saving final appearances in on-screen Who, maybe six Doctors from now, proving to the fans who grew up with a squirrel in the Tardis (who will then all be 40 and balding and taking life seriously) that they were right all along. The clockwork squirrel of their childhood still has what it takes to save the Doctor in his time of need (Pause for nostalgic sigh). I should probably quit before I start convincing myself that having Nut-C the clockwork squirrel as the Doctor's next companion is actually a good idea. After all, who ever thought a tin dog would cut it as a Time Lord's best friend?